The rapture was supposed to occur at 6 PM- did I miss it? I am assuming it did not happen. Can you believe the "press" this got. Unfortunately the fallout is that "nonbelievers" lump us all in together as non-thinkers and overall hurts the cause of Christ I believe. But, for fundamentalists, you couldn't dent their absurdity with anything, least of all Scripture. Oh well, gave preachers lots of good sermon topics. Hope all is well. After getting you email about going mostly to electronic books, I purchased a Kindle, the kind that seems to always be on-line, and tried it out by first downloading a sample of It Took Heroes. Then after evaluating the reading and sound quality, I downloaded for free the book Two Wars by Nate Self, the ranger lieutenant that led the effort to recover the Seal who fell from the back of a helicopter early during the war in Afghanstan. Self wrote a lot about chaplain support and his own faith, and then of his PTSD following the all-day fight above 10k feet and after he resigned his West Point-attained commission. 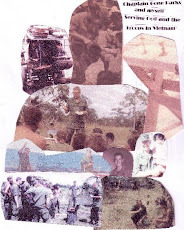 Two Wars is well written and offers lots of insight to the wars of the 21st century, and of the pros and cons of training and fighting with people one knows well, as opposed to the individual replacement we knew in Vietnam. The telling of Self’s PTSD and faith struggles was very hard to read, and left me really sad for a while. KC, no sweat. I'm your chaplain. But, not over the top. I feel pretty much the same way. Yeah, we believe the Pakies weren't complicity in shielding Ben Laden. Like we believe Donald Trump isn't an egomaniac. For some weird reason, politics is so corrupting. What gets me more than anything is the fact tjat rarely does any politician answer a direct question? Spin is the order of the day. Have a safe trip to see your Mom. I remember last year you went. A nice thing. I can't remember, do you have brothers and sisters? Leaving out in the morning for Reno for the 3d platoon, Delta Company, get together. Actually there's going to be a half dozen or less. You would probably remember some of these guys. One is Warren Chan, the only Asian that I remember in the Byattalion. He was Captain Holland's RTO. As I'm sure I've said before, not much into reunions but will have fun, driving up today and back tomorrow. God bless. Always good to hear. Be careful. I understand exactly what you're saying Jerry. It was unfortunately and to a disgustingly large extent, an on-going game of "You take care of me and I'll take care of you." 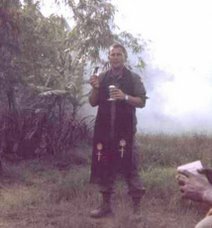 When the 1/501 BN CDR was awarded the SS at his Sep '69 change of command ceremony, I was at LZ Sally, as XO of A Co. I sent the requisite 10 man detachment to the ceremony under command of the Supply Sergeant. The BN XO, a good guy, immediately came to the orderly room to find out why I wasn't in charge. I told him I knew--because I was there in the A Shau when the event supposedly occurred, that it was 100% bogus and that the fool had done nothing to deserve any medal, any time. The Major said "OK" and walked out. I just want my guys, the ones who I know deserved this recognition, to step forward and I know you feel the same way. Good to hear from you; take care and all the best. Don, it is always good to hear from you. Thanks for thinking of me with the Silver Star project. I have some definite ideas about awards and want to share them out of my respect for you and appreciation. I would thank God that we were spared but realize that Thousands were not spared. Seems a little like saying somehow God likes us a little better and I know that is not true. Some things I have not gotten a handle on in my 50+ years as a minister. CN, retired chaplain , in reacting to devastating tornadoes tjat devastated so many I'n his native state of Alabama. My idea and which I even do now is give out a fair amount of money, well for an average person anyway; but, my experience has been if you run across someone in need, $20 or $40 or fifty or a hundred dollars might not have much meaning to us but to someone on the edge, it is "found money" and makes a little difference. Here's an example of my thinking, my grandson and I were at this little park at Pier 39 last week. He is almost three running around--this little kid, maybe twelve, just jabbering away. I'm being a little cautious as crazies are everywhere and I don't want people to think I'm one of them; this is a stranger kid but I talk to her while watching James Raz, my grandson. She tellse they are in San Francisco because she won a contest in the state on history something. Not totally sure of all the details. San Francisco was the prize. I think they were from San Diego. "What was your history project? ", I asked her. Her grandfather was a Marine on Iwo Jima and she collected old photos, letters, created this historical display. It won the contest. Needless to say I was impressed. The father came over. We chatted. I said to him, I am so proud of your daughter. Would you feel insulted or badly if I gave her a few dollars with which she can buy something special. He allowed how it was not nessary. "I know but I would like to do this as it is the only thing I can do to show my appreciation." I gave her my fifty dollar bill that I always keep for emegencies. In my thinking, this 50 bucks was nothing or little to me but to them, it was fifty dollars they would not have had. Did I feel good? Sure. (You could psychobabble that to death.) Was it my need to do it more than their need to have it? Sure. I'm just thankful I can. Other than my tithe, I rarely give other than to individuals. Well, that's not totally true now that I'm thinking about it. But, it is a lot. I sound like I'm Warren Buffett or something. I'm not but have ended up at this stage of life with more disposalable income than I deserve.